My daughter loves all thing asian. She ate sushi for the first time at 2 years old, and dove into dim sum in Chinatown at age 5. So when it's girl's night at our house, I go asian. 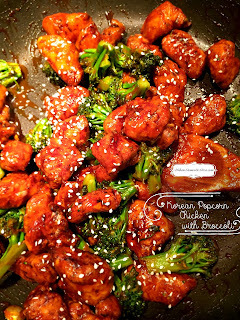 Korean food is a genre we have been exploring lately, and I came across a great food blogger at My Korean Kitchen. This popcorn chicken looked delicious, but more of a street-food-snack-dish. So my mom guilt stepped in. To address the mom guilt I added broccoli and traditional rice to make it more of a meal for the family. I threw the rice in the rice cooker as I whipped up this dish. I steamed the broccoli ahead of time and chilled it until ready to use. With a little prep this is a VERY easy weeknight dish. We LOVED it. And don't skip the gochujang. It really makes the dish. I found it at our local Mariano's, in the ethnic foods section. If you are in a limited food area, try ordering online. It's fermented and can keep in the fridge for a while. 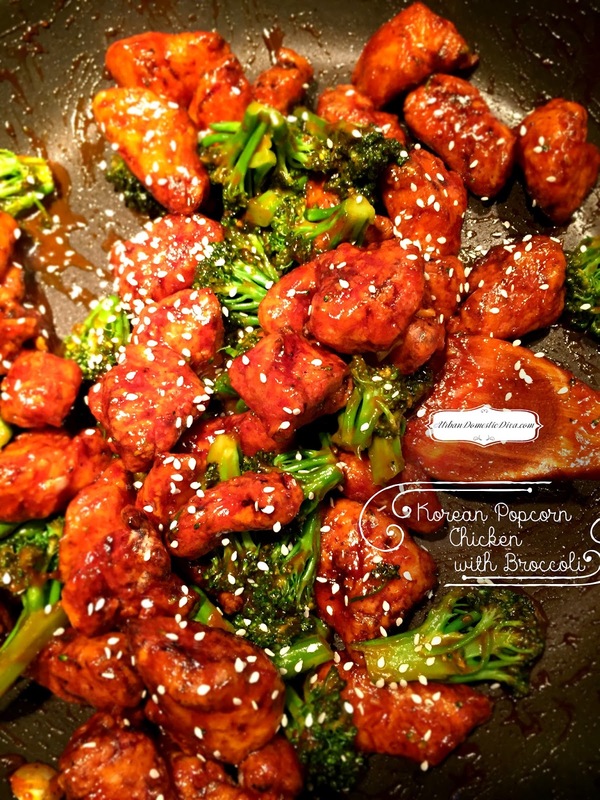 Having it on hand will force you to do some more spicy exploring in Korean food! It's a win win. In a bowl marinate the chicken breast with rice wine, ginger powder, sea salt and ground pepper. Marinate for 30 minutes. Meanwhile in another bowl mix the sauce ingredients. In a steaming basket. steam the broccoli for five minutes until crisp but cooked through. Shock with cold water to stop the cooking. Set aside. Once the chicken is marinated toss in potato starch to cover fully. Deep fry the chicken in the fryer until golden brown on all sides, about to 2 to 3 minutes. In a large sauté pan cook the sauce down until thickened. I didn't use all the sauce- I left about 1/4 of a cup in the bowl because I didn't want this to be too saucy. If you want a little bit more sauce use all of it. The dish traditionally has just a thin coating of the sauce on everything. 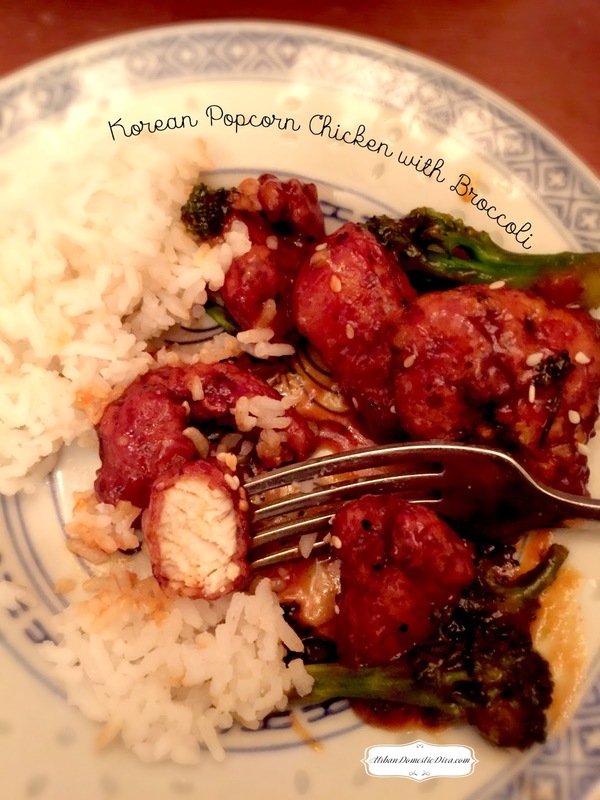 In the thickened and hot sauce go the popcorn chicken and steamed broccoli and toss to coat everything. Sprinkle top with sesame seeds for garnish and green onions if you wish. My daughter hates green onions so I skipped it.